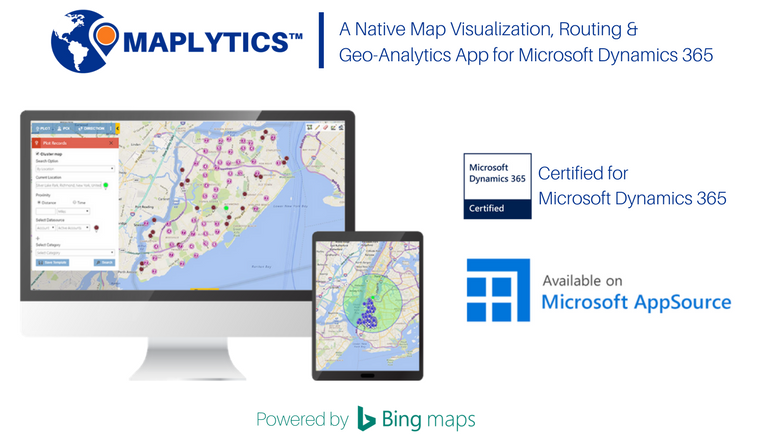 Maplytics™ is a leading Certified for Microsoft Dynamics 365 (CfMD) solution that provides a seamless Bing Maps and Microsoft Dynamics CRM integration. 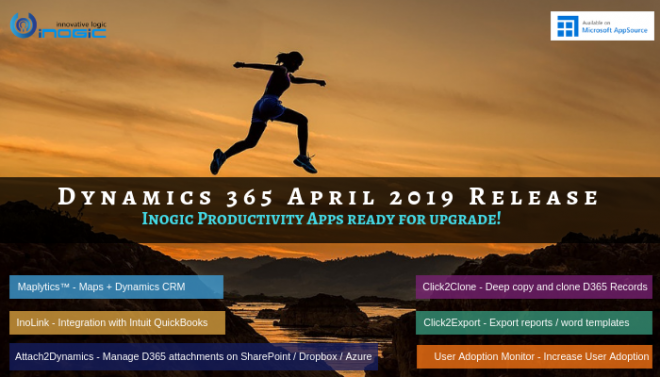 Maplytics extracts the geo-coordinates from Dynamics CRM data to enable organizations with intuitive map visualization, routing and geo-analytics capabilities within Dynamics CRM. Microsoft Dynamics CRM comes with Bing Map integration out of the box. Maplytics takes this a step further; it allows you to integrate all entities including custom entities so you can explore more on customer statistics, know them better, serve them better and have more happy customers and grow your Business. Maplytics allows you to plot Dynamics CRM on a map for location-based analysis, perform radius search to find nearby customers, schedule and manage appointments on a map based on priority, balance sales territories with intuitive sales territory management capabilities, create and share optimized routes, and perform regional sales analysis by creating insightful Heat Map visualizations. Will Maplytics affect my existing customizations in Dynamics CRM? No, it is supplied as a managed solution that is easy to install and un-install without affecting your existing customization. What versions does Maplytics support? Maplytics supports all Dynamics CRM deployment models namely On-Premises, Online, Office 365 and Partner-hosted. It supports Dynamics CRM 2011 and above, Dynamics 365 Customer Engagement. Maplytics is available at 10 USD/Euro per user per month. Special offers and volume discounts are also available. How to get started with Maplytics? Get you 15 days free trial from the Website or Microsoft AppSource to get started with Maplytics. Write to us on crm@inogic.com with your CRM version and deployment (On-premises or Online) model. For any assistance in implementation, customization, migration or upgradation of Dynamics CRM, get in touch with us on crm@inogic.com. One of our customer is looking for the below product. Kindly share us the best reseller prices & purchase link for the same.